STRASBOURG—The European Armenian Federation for Justice and Democracy welcomed the European Parliament’s firm position with regard to Azerbaijan, whose representatives were lobbying hard to derail the resolution. A group calling itself the Alliance of Liberals and Democrats (ALDE), was working to thwart effort to approve the resolution, which strongly condemned Azerbaijan for pardoning axe-murderer Ramil Safarov and subsequently treating him like a hero. “This astounding case raises, once again, alarming questions about the values, violence and the hatred which Azerbaijan preaches to its citizens. It also is evidence of Azerbaijan’s of respect toward conventions and international treaties,” said Kaspar Karampetian, President of the European Armenian Federation. The French-Armenian community will protest the arrival of Azeri President Ilham Aliyev to Paris on Tuesday. The European Parliament on Thursday adopted an urgent resolution, by a vote of 58-13 with five abstentions condemning the glorification granted by Azerbaijan to Ramil Safarov, the Azerbaijani officer who brutally hacked lieutenant Gurken Markarian, an officer of the Armenian army, during a Partnership for Peace training program, organized by NATO in Budapest in 2004. In its urgent resolution, the European Parliament “deplores the hero’s welcome accorded to Mr Safarov in Azerbaijan and the decision to promote him to the rank of major and pay him eight years’ back salary upon his arrival, and is concerned about the example this sets for future generations and about the promotion and recognition he has received from the Azerbaijani state”. The text reflects the atmosphere of the debate which preceded the vote, during which several European Members of Parliament, such as Véronique de Keyser (group of the Progressive Alliance of Socialists and Democrats – Belgium), Charles Tannock (European Conservatives and Reformists – Great Britain), Lunacek (group of the Greens – Austria) or Vergiat (Confederal group of the European Unified Left – France) expressed their shock as for the grace granted to the murderer by Azerbaijan, and qualified this attitude of “scandalous.” Paska (Europe of Freedom and Democracy group – Slovakia) even compared the Aliyev regime to the Mafia. Our Indo-European cousins, the Slovakians, are a natural ally against the Hungarian aggression which began not with the extradition of Safarov but with the unprovoked attacks against Armenians made by the Hungarian political party Jobbik some year ago. Slovakians are historical enemies of Hungary and thus we should seek support for our cause against the Hungarian assault with them in particular. In return we should support Slovakia against Hungary which seeks to steal land from said country. Don’t forget, this criminal was also given a free apartment when he got back in Baku. Perhaps Lt. Markarian will be remembered as a victim of racism and hatred just as Hrant Dink; not a nameless individual murdered by a coward and honored by an artificial nation . We must honor his memory by ensuring that the world see clearly from this horrific act that Artsakh can never be under Azeri rule and that their core racism is clear evidence of their lack of commitment to peace. Remember his name and honor his memory. How can Armenians resist and receive justice against the huge OIL money that Azerbaijan is pouring everywhere, while its people are dying of poverty. The Armenian government is stupid and childish it it thinks that it can be a full member of the EU. To be a member of the EU, you have to have open borders with your neighbors. 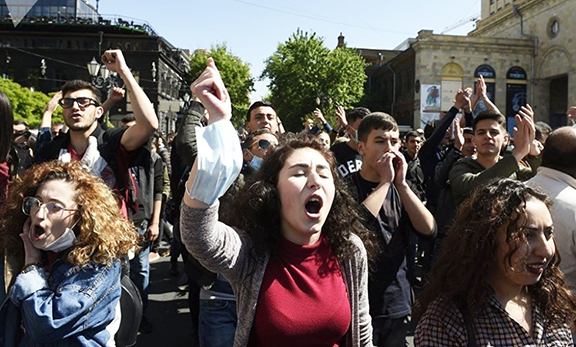 WHAT ARMENIA DOES NOT NEED IS OPEN BORDERS WITH TURKEY AND AZERBAJIAN. The Turks will hijack the Armenian economy. The government is so corrupt that they may let the Turks do that. It is important for Armenia to build alliances with Georgia and be a mediator to create peace between Russia and Georgia. the georgians are also corrupted and against armenia. never trust the georgian, european and american! the armenians worldwide have to wake up and fight. John, 1) Georgia and Georgians are one of the BIGGEST enemies of Armenia. They are liars and backstabbers 2) Armenia should have NO interest in the conflicts of others 3) Armenia WILL be a member state of the EU one day as long as it cleans up its act which it will. 4) I agree we should NEVER have open borders with turkey, their cheap goods will FLOOD our economy and their people will ruin our culture.